Sold by MuscleBlaze (4.7 out of 5 | 3,144 ratings) and Fulfilled by Amazon. Gift-wrap available. Sold by MuscleBlaze and ships from Amazon Fulfillment. Ships from and sold by eZshopping. 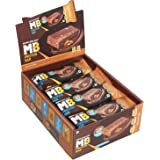 With 22 g of protein, MUSCLEBLAZE Protein Bar offers the highest protein content amongst all protein bars available in the market. 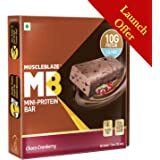 Made from a blend of quality protein sources - including imported whey form the USA, you can be assured that every bite is good for your health and aligned to your fitness goals. With No Added Sugar and high fibre content, this protein bar has only 9.5 g of net carbs making it the best pick for calorie conscious individuals. 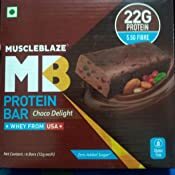 MuscleBlaze brings to you the protein which you can chew and carry in your pocket wherever you go! 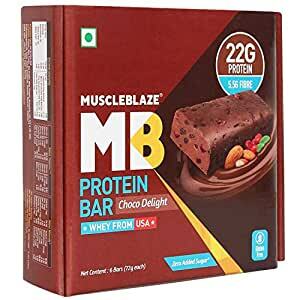 If you are a fitness enthusiast who is always on the go, the new MuscleBlaze Protein Bar with 22g of protein is here to save you from those stubborn hunger pangs which show up out of nowhere. 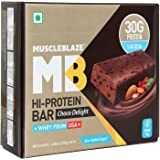 To make sure that you eat only the clean and sugar free meals, that doesn’t put any hurdles in your fitness journey, this protein bar is made using the best quality Whey Protein Isolate and all things good. With the goodness of clean carbs, fibre, nuts, and berries, this bar melts in the mouth with Choco Delight flavour that never fails to soothe your palate. Stack these bars in your gym bags, handbags, and anything that you carry along and never feel guilty of eating high sugar and fatty foods. MuscleBlaze is the pioneer in the sports nutrition market of India. We at MuscleBlaze have a team of experts who believe in creating nothing but the best and ensure that only the high-quality products are delivered to you. Our passion for bringing the international-grade fitness supplement has made us look around the world to source the very best whey and flavors. Driven by the desire to exceed your expectations, we brought together pharmaceutical expertise and the best experts of the flavors to create a path-breaking formulation with unmatched taste. We not only take purity seriously but guarantee it. It's the only brand in the world that empowers a fitness enthusiast to verify the authenticity of their purchase by SMS. Each MuscleBlaze product carries a unique, non-duplicable code. 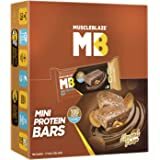 MuscleBlaze has been developing top notch sports nutrition supplements since years and now the brand has come up with an all new Protein Bar with 22g of protein and 5.5g of fibre. The pioneers have used the same technology to develop the bar that it uses to develop its benchmark products. Purity Guaranteed! 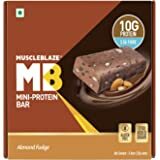 Unlike many other protein bars, MuscleBlaze Protein Bar is handcrafted to have that delectable chocolate flavour that never fails to soothe your palate. This bar in Choco-Delight flavour is your go-to happy meal for an anytime anywhere healthy munching. 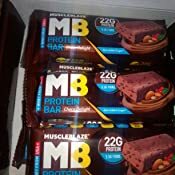 At MuscleBlaze, we promote healthy eating and your worries for counting calories is all on us as this Protein Bar has the lowest calories in the category and contains no added sugar making it a win-win! With the goodness of fibre and clean carbs, this bar deserves a designated space in your office, gym, and shopping bag! 1.0 out of 5 starsHorrible taste, will not order again, EXORBITANTLY costly. Horrible taste! Tastes like eating some 'chemically', sticky powder! Will NOT order again. Also, ₹120 for 22gms of protein means you're charging like ₹6/gm of protein, too costly. Better option? Carry a small plastic box with a scoop of Whey + oat flour. Put in a shaker and drink away! MUCH more healthy than this chemical crap! 4.0 out of 5 starsFabulous! Exceptional quality. Was looking for something like this with moderate protein and a budget option. I use it often as a pre workout nutrition bar, 90 minutes before the workout. My only issue with everything from muscleblaze is lack of flavours, and sadly, thats still present here. Get us more flavours. The bar is just OK in taste. Feel other bars such as yoga bar are far better in taste, feel smooth in taste and better blend of ingredients. 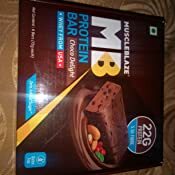 It is good protien bar for the one who are tum freak and they want protien as well as they are chocolate flavour lover also so this product is made for them im also a gym freak and i really like this one. This protein bar is perfectly fine and the taste is better than most protein bars available in the market . Some people who are saying that it is not suitable for fat loss because of sucrose,honey etc then I must tell you that "fat loss" is possible when you are following a strict caloric deficit plan and "muscle gain" is possible when you are following a caloric surplus nutrition protocol. I know few people who have done ketosis but still they were not able to shred. And the basic reason was they were not counting their calories! 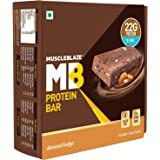 I personally think that you should be using protein bars as meal replacer when you are having hectic schedule, too much travelling and sometimes to satisfy your taste buds without having any cheat meal. For me this bar is working really well and i'll happily suggest anyone to try this thing ! 5.0 out of 5 starsContains vitamins and minerals. I bought this healthy high protein meal replacement because of its on the go protein without any sugar. I liked this product due to its great taste. Pro: 1. It contains 27 essential vitamins and minerals. They helps you to recover at faster rate and remove weakness in body. 2. It contains omega-3 fatty acids from natural sources like almonds. So, you can get a healthy brain with healthy body. 3. It only contains 9.5 g of carbohydrates, which helps to gain lean muscle mass rather than fat. 4. Its chocolate flavor is super good in terms of taste. 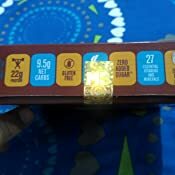 Cons: it may be slightly bigger than ordinary choco bars but if we look at its nutritional value it is good. How do I review a food product that I just can't eat. The first word that flashed in my mind when I took the first bite is "bitter." I had my own doubts if I could finish eating this bar. Downright horrible taste that can be downed the throat only with lots and lots of water. Nutrition wise the specs sound good. Does a decent job and keeps you full for quite some time. However, the after taste is also nauseating. So overall, it's not a product I'll ever willingly try again.